Jurgen Klopp will be feeling quite good about his transfer business so far. The arrival of Brazilian goalkeeper Alisson Becker will mean that the Reds have added to their impressive summer haul of Fabinho, Shaqiri, and Keita. 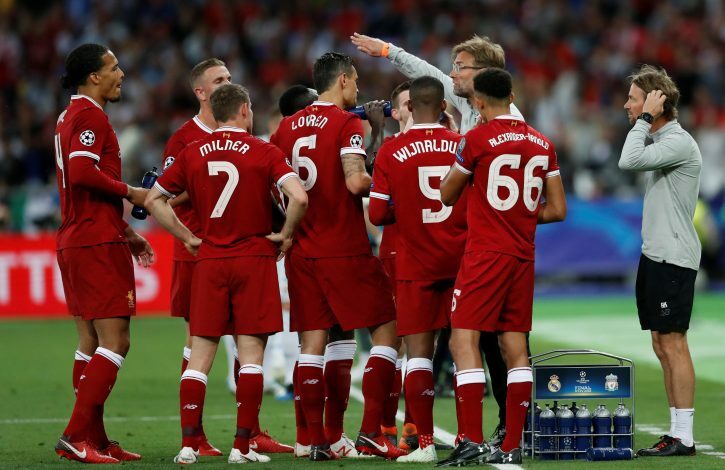 The side has invested smartly with a view at glory, and this team could possibly be the most apt one to realize Klopp’s dream of playing total-football, winning counter-attacks, and providing creative conduit play that is powered through the midfield. His tenure at Anfield has only shown us hints of that so far, but this could be quite something going into next season. Bye-bye goalkeeping woes. In the likes of Simon Mignolet and Karius, Liverpool truly have had the luck of the draw and the cruel hand of fate against them. However, by signing the Brazilian, they have assured that a world-class talent is guarding their goal at all times. 19 years of age and a whirlwind of talent, the English sensation has provided Klopp with a reliable flankman for years to come. His proven knack from last season will ensure that the often mediocre displays of Nathaniel Clyne will be outdone and a smart ploy will be undertaken going forward. Let’s be frank, the Croatian isn’t the most reliable of centre-backs that football has to offer, and despite his nation’s World Cup success, the 29-year-old still has some work to do. However, in a stabilized defense, he does the task for Liverpool, and that may be the only thing that matters at the end of the day. The real reason Liverpool fans will have faith in their defense next season. The expensive signing has already proven his worth over the past months, and now, the 27-year-old Dutchman looks more and more in control at the heart of their defense. Do good things await? What Alexander-Arnold did to Clyde, the 24-year-old Scot has done to Alberto Moreno. Although he took his time to settle with the club’s philosophy, both the manager and the supporters have grown to enjoy his work ethic and dynamic ability in the spot. The Brazilian is undoubtedly Liverpool’s most crucial signing of this window. Although he will take some time to adjust to English football, the defensive reliability he’ll bring to the club, coupled with his creative tendencies, will be a sight to relish in the season to come. Inseparable from Liverpool’s lineup and a man that Klopp has grown to rely upon to execute his style. The summer’s outing in Russia with England has set a valuable precedent for the 28-year-old’s potential, and coupled with the likes of Keita and Fabinho in midfield, this could be the start of something great. Liverpool’s assured signing of the summer and a welcome creative burst for the side. While Thomas Lemar was the signing that fans were earnestly hoping for, it is the goal-scoring and goal-creating abilities of the Guinean that is bound to surprise the crowds, and the Merseysiders could benefit quite a lot by giving him free reign. The Egyptian King will be itching to get back into action and start scoring again after last season. The World Cup was disappointing for him, but he has a promise to keep after breaking the goal-scoring record last season. Now, with the benefit of a revamped midfield, something brilliant definitely lies on the cards. The vital part of the trident that found over 90 goals last season, the role of the Brazilian will be even more important in the campaign to come. His pace makes for valuable counter-attacking ploys and the essential quality of providing a match-winner seems ever embedded. More joy still? If it ain’t broke, don’t fix it. This is what Klopp is bound to stick to this season as well, and ensuring the 26-year-old forward remains a part of the forward trio is crucial to that. Liverpool found a formula last season that worked wonders, and now, with their new investments in place, more fodder could be created for this man in particular. This team looks eager to prove a point, and perhaps, is even set to deliver to their fans what they have been aching for decades now, along with some other silverware too. Will Klopp’s antics and tactics ensure that it is their year at last?